Security assessments of each facility in a district can be overwhelming and expensive. Many companies and consultants offer reviews of school district facilities and if that is the direction your district wants to go, we think that is a good idea. With that said, we also realize that extensively detailed analyses of district facilities can be costly and time consuming. Safe School Assessment Checklist - If your district is looking for a template that can be customize for each school site, we recommend using the following generic checklist that is in both PDF and a customizable Word format. School Security and Emergency Preparedness Assessment - The National School Safety and Security Services offers an online tool to assess a school’s security and emergency preparedness. K-12 School Safety and Security Audit Toolkit - This toolkit provides another tool to self-assess school safety and security. School Facilities Vulnerability Assessment - This assessment offers a comprehensive manual for assessing the vulnerability of school facilities. Note the Action Checklist on page 4, Recommended Actions on page 5, and Assessment Charts on pages 7-39. Like any emergency, a reunification process must be planned prior to any event. All districts should establish reporting systems to be used by staff, students and families that provide anonymity. A district level safety committee should meet at least quarterly to create, reflect upon, and update district safety plans. The district/school safety plan should be collaboratively updated at least annually by the safety committee. Districts and school sites should develop relationships with local first responders, including law enforcement, fire department, and Emergency Medical Technicians. Lockdown drills should be scheduled year round with a set approach that staff is familiar with, starting at the beginning of the school year. Research shows a direct correlation between strong SEL programs and reduced behavioral issues with students. All schools are required to have a comprehensive safety plan with specific roles and guidelines reviewed by stakeholders on an annual basis. Preparing for emergencies and response to crisis means working with mental health professionals and staff to identify signs of possible issues and then planning for responses. Many schools have found it helpful to create a crisis response box that is shared with a local police/sheriff’s department. To ensure the safety of students, faculty and staff, schools and school districts should create comprehensive, multi-hazard emergency management plans. Immediately call a lockdown and follow the same process used in your drills. Utilize the intercom or communication system to announce the lockdown school-wide. 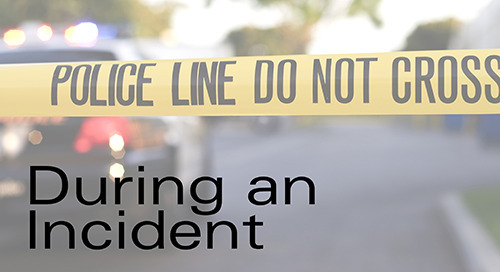 As soon as an emergency situation is identified, either directly call or designate someone to call 911. 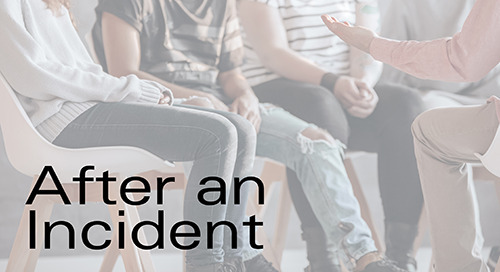 As soon as it is practicable, establish your incident command center and begin operationalizing your School Emergency Response Plan. Be sure to communicate with parents and key stakeholders so they receive accurate information from you. In the event of a large-scale emergency, your local law enforcement will likely step in and help you ascertain the relocation site that will be used. The goal with reunification is to safely bring families together. The reality of a fatal school violence event is you may have students or staff that are casualties of the event. It is important to reach out to known mental health providers or partners as soon as possible after a school crisis. In the aftermath of an incident, communication is critically important. Staff must be informed of key information in a confidential staff meeting.